Once upon a time, many years ago in a far off Kingdom, there lived a very beautiful Princess. However, our story doesn't concern her. In fact the story concerns her very distant cousin and handmaiden to the Queen, the Lady Grace. Unfortunately, Grace was neither a lady, or for that matter, a maiden. Having had given up her maidenhood many years before to a traveling troubadour, once she realized that her prince wasn't coming. Since then there had been many a bold knight under her silken sheets, to the point where she'd lost count. Also in this Kingdom lived a very ancient and very wise Dragon named Mithradates. Mithradates had for years devoured knights and maidens alike and had become the scourge of the kingdom. But after a thousand years of this he became bored by the same old scene. Capture a maiden or two wait for the inevitable knight on horseback. Catch and eat the horse, battle the brave knight and devour him, then devour the fair maidens as well. This went on year after year, century after century until poor Mithradates was bored to tears. The once proud beast was beside himself in boredom. Not to mention that the effect of eating armor year after year was beginning to back up on his now delicate stomach. In a final desperate bid to end it all, he blew down the entrance to his cave sealing himself in. Time passed, a thousand years came and went. And the memory of Mithradates faded from the kingdom. The once powerful beast, first became a legend then a myth and finally was only invoked by mothers to scare their children into obeying them "If your not home by dark, Mithradates will get you and eat you up." In fact Mithradates and his kind were now said to have never existed by the learned men of the kingdom. And who knows they might have been right, if the earthquake hadn't shook the kingdom that dark day in May. For when it did it opened Mithradates cave and woke the sleeping dragon. Mithradates opened one sleep-incrusted eye and looked around the cave from his position atop his hoard of gold. When he had inspected his lair and seen that all of his gold and jewels lay undisturbed, he closed his eye. As he was about to fall back asleep, aftershocks brought the entrance to the cave down. An explosion of light and dust broke upon the inner chamber where the great dragon lay. Mithradates was up now and with a centuries-clogged roar that sounded more like a cough than a roar he made his way through the rubble and into the light. After a thousand years of slumber Mithradates found his muscles stiff, with a backache that went all the way down his spine to the tip of his tail. Not to mention the effects of not having gone to the bathroom in ten centuries! An hour or so later Mithradates was feeling much better except for the over whelming hunger in the pit of his stomach. By now even the knights' rusty armor had long since digested while he slept. Mithradates flexed his wing muscles and the long sinuous wings unfolded from his back as he made ready to fly. He soon realized that he was exceedingly weak and flying might not be a good idea. So as the sun set over the isle of Avalon Mithradates made his way down the mountain from his lair and into a sheep pasture. By the time he staggered back to his cave he had eaten 20 sheep and some infernal contraption that talked at him in a strange but almost familiar language. It shot little arrows at him when he picked up a sheep and swallowed it whole. They sparked a bit as they harmlessly bounced off his scales and as an afterthought he turned and ate the thing and proceeded to slaughter most of the herd. When he had eaten his fill he hiccuped up a knight's helmet that had been lodged in the hole in his throat from where he spit his dragon fire. When he did this it caused him to sneeze and sneeze and sneeze again, setting fire to the meadow and most of the now screaming sheep. Feeling like a drunken sailor at the end of his leave Mithradates stumbled back to his bed and slept a fortnight. Around Mithradates the people of Westmorland county and in particular, the village of Armory went about life never suspecting what lay near the peak of the Skyler's Mountain. From the top of the mountain on a clear day you could see the Isle of Man. Most days you could at least see the Irish Sea. There was much ado in the village today as the Kings first cousin and lady-in-waiting to good Queen Elizabeth IV, the lady Grace was coming back to open her ancestral home Kirkwood Manor. There was talk that her ladyship was bringing good news about a new military spaceport for the county. Armory's chronicly underemployed youth were becoming the scourge of European ultrafootball matches. For the past two days fleets of androids had been going over the manor from top to bottom in anticipation of her ladyships arrival. Nothing of course was ever officially announced about the travels of the royals, not since the Freemen terrorist strikes of 2081-2082. When the smoke from that deadly 6 month long rampage ended there weren't many blue bloods left. The ones that survived were a whole lot more concerned with the problems of their peasants than their forebears had been. And since the royals were for all intents and purposes powerless the people made much of the remaining few. They were seen primarily as sources of entertainment and of course an ancient national tradition. Lady Grace, the Duchess of Armory, dreaded this trip to her ancestral home. It was bad enough she had to return to earth from her block of flats in the Lunar city of New London. She was after all pushing 30 and she hated what earth's gravity was doing to her body. Things were starting to droop! But James had called her back to earth to do her part rebuilding England's economy. Since Scotland and Whales succeeded from the union things had gone from good to bad almost over night. Now James XI was spending almost a quarter of the crown's purse on a rebuilding of high tech programs that just might pull England out of debt and off the dole. The big silver space liner fired it's landing jets as it came in for a three point landing then taxied to the gate. Twin spaceways drove out from the building to meet the rocket. One for first class passengers and the other for everybody else. Lady Grace was soon on board a nearby hopper for a flight to Kirkwood Manor. The hopper touched down in the courtyard and Lady Grace was greeted by her private secretary Margaret who had flown on ahead. Apparently she was needed to give a speech and symbolically turn a spade full of earth to signify the building of the spaceport. She'd be here for three days and then she could return to the moon. She spent the day going over the speech and a hundred other details with Margaret. After tossing and turning the night away on a mattress instead of her sleep beam she arose late. After a late breakfast she decides to skip another speech rehearsal and go horseback riding on the estate instead. She mounts a chestnut mare and with the aid of a flycam for protection, she heads out on a trail she hasn't been on since she was a girl. Up the side of Skyler's Mountain she rides to where she remembered a beautiful meadow. She'll ride there and beside the babbling brook she'll have a snack of wine and cheese that Margaret thoughtfully packed before riding back to her responsibilities. Lady Grace wasn't prepared for what she found in the meadow. The bank of clouds that had been sending forth a light mist suddenly opened up and the sun shone down on the valley of carnage. The once beautiful meadow was a charred wreck of it former self. The odor of burnt wood and wool lay over everything. The carcasses of a hundred sheep lay scattered about the meadow. Whatever had caused such destruction was gone but she could feel its presence somewhere near by and so could her horse. As the horse started to whinny she decided that she had seen enough and was about to turn and go when the horse reared up and threw her to the ground and bolted toward her barn. She was getting back up and dusting herself off, silently cursing the horse when a huge shadow flew overhead and a pair of claws reached out and grabbed the horse. Mithradates had been sitting on a ledge watching the lady Grace for quite sometime. He hadn't really planned to attack until he saw the horse bolt out from under her. Then his reflexes got the better of him and he pushed off the ledge and made a beeline for the horse. As he tried to rise with the struggling animal it became painfully clear to Mithradates that he still hadn't recovered from his 1000 year nap as he and the horse fell back to the ground with a crash. Lady Grace took one look at Mithradates and feinted dead away! A long wet sensuous tongue brought her back to consciousness as she found herself quite naked and looking into the jaws of a nightmare. "Arrrrgh my lady, fear thee not. I'll not eat thee, thissss day! Thy horse has ssated my hunger for now. Thou dost taste fair, but not as a virgin doth taste. What is thou husband'sss name?" Hissed Mithradates. Lady Grace could not believe her eyes or ears. Was this all really happening? Surely she must be dreaming and Margaret would soon be awakening her. But she knew that what she saw was real. For every time she breathed, the rib she had cracked, from her fall off the horse sent a shooting pain down one side. "Arrrrrrgh come ye now my lady, I'll not harm thee, in fact if thou has gold or precioussss jewel I'll make thee a bargain! Long have I ssslept and long has my precious hoard remained the same. I must at once make repairs to my hoard and seek yet more jewel and gold. So tell me fair one, what is thy husband'sss name and rank? I must this know to make a bargain with him for thy ssswift release," spake Mithradates. "I am the Duchess of Armory, the Lady Grace. I am the lady in waiting to her majesty Queen Elizabeth and cousin to the King. I have no husband nor do I want one. This can't be happening; you can not be real. You are but a nightmare that I will soon awaken from, be gone said Grace. "Haaassssst, thee have no husband? What manner of place is thisss? Hath common sense and moral'ssss flown away? Is this not still Avalon? Home of the Angle, Pict, Celt and SSSSaxonssss? Did not mighty Rome once command these Isle'sss? Is thiss not the land of my youth? Tell me my lady is thisss not so?" "Well dragon or hallucination or whatever you are, this is indeed England, called Avalon in legend. If you would live this day through, you will immediately give me back my clothes and be off with you before they come looking for me. I'm sure my flycam has captured all of this and as I speak there must be a army of soldiers on there way to rescue me." Mithradates was a little taken back by this woman's tongue. Had she no respect for him or her position? He thought back through the long centuries for another such example but could find none. Finally all he said was, "My name is Mithradatesss and you're coming back to my cave to await your ransom." Saying this he reached down and gently picked her up with his clawed hand. 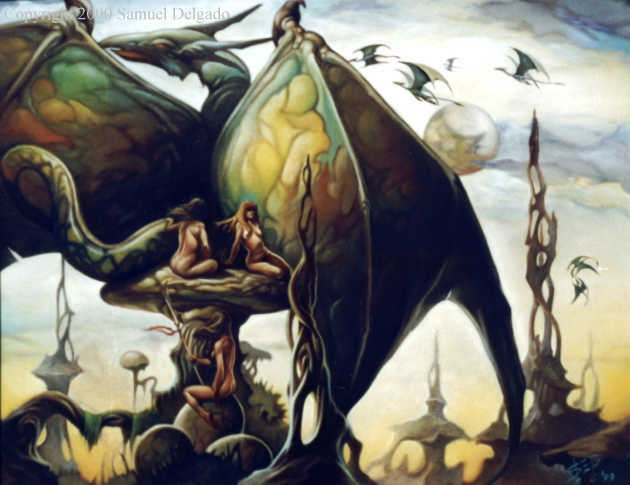 Holding her gently but firmly he unfurled his wings and arose slowly into the sky and headed back to his lair. Back at the estate they knew something was wrong and down in the village several hoppers were airborne and heading up the mountain to the meadow. The flycam had seen the horse throw lady Grace and had focused on her as the Mithradates grabbed the horse and proceeded to crash to the ground directly on top of the flycam which said nothing more with several tons of dragon on top. * So all the android monitors saw was Lady Grace fall off her horse and then the view screen went black. They had been expecting to pick up her Ladyship and fly her back to her compound so they were hardly prepared for the sight that awaited them. As grisly a scene as one found on any battlefield and absolutely no sign of her ladyship. Charred and rotting sheep flesh everywhere, the muzzle and reins of Lady Graces horse, Lady Graces clothing and boots where found and a crushed flycam. Lady Constance de Coverlet who piloted one of the hoppers became violently sick and couldn't do much else for a while. However piloting the other hopper was Major Sir. T.K Chesterfield O.B.E. ; late of the King's own Lunar Rangers, went right to work alerting the authorities and placing a viddy to his friend at the Palace, informing his majesty of the situation. He then proceeded to scour the countryside looking for clues and had several marked off when Chief Constable Thackery arrived. "Good Morning Major, said the Constable. What's all this then? "Very peculiar Constable Thackery. Just let me point out a few oddities to you. I've touched nothing but had these spots marked out on the hopper's viewer to point out a few clues. Oh Lady Constance did disturb one spot with the remains of her breakfast but other than that it's as we found it. For example this is all that is left of Lady Graces Horse, about half of her nose, said the Major." He touched the screen and it showed a close up of the mare's remains. "This is a pile of Lady Graces clothes Constable. Here, here, and here something ate and burned a flock of sheep," and various piles of bones and rotting wool passed the screen. "There is a crushed flycam in case you could tell what it was. Oh and the strangest thing of all. Now there aren't many of these as I supposed the ground is too rocky but look at these tracks. Ever seen their like? Three clawed talons like a birds or dinosaurs but another clawed toe facing the other way, kind of like an opposable thumb!" "Well thank you major, you've given me a lot to think about, if we need you we'll be in touch," said the Chief Constable dismissing the Major out of hand. Then looking down the mountain he saw the crime-lab hopper making it's way up. Dinosaurs indeed! He'd soon get to the bottom of this! The crown was probably already watching over his shoulder and he wasn't about to be found wanting in any way! Lady Grace realized she was sleeping but it felt so good. She was warm and content for the moment and she reached out and wrapped her arms around a taloned finger ah, so nice and comfy. AAAAAAAAAAAAaa she screamed as she opened her eyes with a start, to the looks of a much-bemused Mithradates. "Hasst my Lady had her fill of sssleep yet? We must talk of the thing to come. To ransom thee, I will thisss day begin! Now what my Lady shall be thy price? I will seek a full hundred head of cattle. Plus thy weight in gold and precious gems and five full barrels of wooly beer. This to me they will deliver within the fortnight or else!" "Or else what wyrm?" Asked the Lady Grace. "Or else I will be forced to eat you up and find another fair damsel miLady, said Mithradates with an evil grin that sent a chill to the very core of Lady Grace. "Now where is my parchment and quill?" Constable Sgt. Tuttle re-read the evidence and conclusions coming out of the crime-lab. No the chief constable was not going to be pleased. No not one bit, but there it was. He'd checked the machine over from top to bottom and it was working perfectly. He'd submitted everything they knew about the case plus all of the crime-labs finding from all of it's sensors three times and the results were exactly the same. A fire-breathing nightmare from fairy stories was alive and on the loose in 22nd century England. Is that report finished sergeant? The Minister for Public Safety has been on the viddy all morning. Lets hope this analysis clears things up? I would hate to post the Major's conclusions to the crown. The sergeant said nothing but handed the viewer to the Chief Constable and waited for the explosion, he didn't have long to wait. Yesss that ssshould do. Aaarrrrg where didssst I place that sssealing wax and my signet? Could hardly be considered a true writ without my seal! Aaarrrrgh tisssss here aha! I shall roll the parchment and seal it thusss and thence deliver to your ladyship'ssss manor at the stroke of mid-night! Now come talk to me my lady of this 22nd century!" "Constable Tuttle what does this mean?" Said Chief Constable Thackery. "Well sir, according to the evidence and ancient evidence through the Royal data bank, what we have here is a Dragon who has kidnapped the Lady Grace and will probably offer her for ransom. Yes, I know how that sounds sir and I wish I could say its not so but that is the conclusion of the crime labs computers." If you noticed I triple checked them and ran a complete diagnostic on the main frame. That�s the crime-labs report and it's sticking to it. Of course the Chief Constable didn't believe it and called for another crime-lab. Along about midnight the new machine was making the same report to a highly agitated Chief Constable Thackery. Mithradates left the sheepskin at the front door of Kirkwood Manor quietly returning to his lair without setting off a single alarm. Ten minutes later a passing security-bot found it and all hell broke loose. Although Mithradates had managed to avoid the cameras his shadow hadn't. It was there on two cameras for the entire world to see. And deny it all he liked the Chief Constable finally was forced to see the light about the shadow and his crime-lab reports. The sheepskin was poured over first by the security-bots and then by the Chief Constable and then the crime-lab. Although a bit hard to read the Middle English soon gave up all it's words and intent to the computers. It was a shaky, nervous Chief Constable Thackery who stood at attention and gave his report over the viddie to James XI. The King didn't laugh or even question the Constable, which was good, because Thackery was ready to faint at the drop of a hat as it was. He just took everything that Thackery said as truth and thanked the Constable for his report, concluding that he was on his way to intercede for his cousin in any negotiations. Of course there was nothing to negotiate. Either Mithradates got his beer, gold and cattle or the royal family was going to be one member short. It was only his greed for more gold that had kept Grace from becoming a snack to begin with. Mithradates hiccuped and spit four steel horseshoes out and eyed them as they rolled around. Horses with metal feet what would they think of next? The British defense network was about to show Mithradates just that in a low flying hopper that had discovered Mithradates cave and was shinning it's spotlights inside. Fortunately for the hopper pilot and Lady Grace they didn't reach the inner lair. For Mithradates was a dragon of his word. Had he not captured the Lady fair and square? He had not harmed her and never would if the ransom was paid? If however he found that the humans didn't stick to his agreement he would indeed eat the lady and whomever he found to be lacking in the honesty department. There was nothing personal about it, just fair was fair. Now all that was to do was to wait and see if the humans complied? He spent the next two weeks talking to Grace about this new world he had been reborn in. Seems quite a bit had changed in the last ten centuries! He fed the Lady Grace on wine, cheese and bread he was able to find in a nearby cottage. The owners were away when he called which was just as well as Mithradates was starting to get hungry again. The horse and the sheep were starting to wear off and he knew it would be the cattle or Lady Grace if the moon arose on an empty field. The time had arrived and he grabbed the Lady Grace again and looking hard and long at what lay below him he turned to her and said. "Methinksss the King is fond of thee milady? I see a herd of cattle; five bright barrels of what must be beer and a pile of gold. I will set thee free. However if this proves to be a trick I will hunt thee down and devour thee, this I promise though you run to the ends of the earth! The great dragon leapt into space with the Lady Grace held gently in one hand. He flew her to her manor house and landing just outside the wall put her down gently and then gave her one last lick from her head to her toes perhaps to remind himself of her taste and smell. Then in an instant he was gone and Grace stumble toward the gates and safety. Not knowing what was going to happen the King had delivered exactly what Mithradates had demanded plus a little something else, a tracker. Mithradates scooped up a steer and swallowed it whole and then grabbed another. He took his time and chewed this one savoring the taste and aroma. It took him a minute to figure out how to open the barrel but then in quick succession he open and drank three of the barrels and turned his attention to the gold. While this was happening the Lady Grace was found and reunited with her cousin and some clothes. She had just begun to feel secure again when the King told her about the tracking device. "Oh No, she screamed. You mustn't do anything like that. If you don't keep your bargain he will eat me. You can't use that, he's very smart, very clever, no you can't do this!" Even though the King assured her that the armed forces were standing by to attack on the Kings command she would have none of it. Stopping only to get dressed she ran out to her hopper and set it a course to the London Spaceport. Just as her rocket was taking off all hell broke lose on Skyler's Mountain. As soon as the gold was moved the King launched his attack. Wave after wave of fighters and hoppers made Mithradates cave a living hell. When the bombing stopped the top half of the mountain was gone. Shock troops found the lair and it's huge hoard of gold and gems. Enough perhaps to make Britain great again? Search though they did they never found the dragons body. 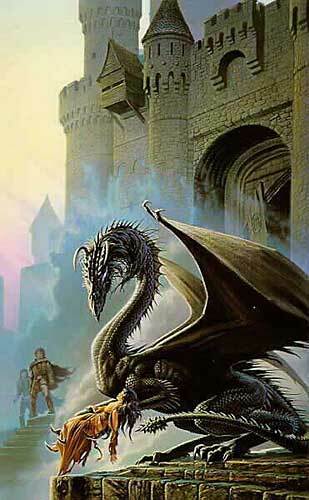 Eventually it was said to have been destroyed in the bombing, although never a trace of the huge Dragon was found. It was a little over a year later that a knock came on a window of Lady Graces New London lunar flat. A neat trick considering that window was 600 feet from the ground and there was no air or air pressure on the outside. She knew who it was and tried to make a dash for the doorway when that window suddenly collapsed outward and she was sucked out of her flat and into the waiting jaws of Mithradates, chomp! When would these mortals ever learn to play fair? Did she think that running to the moon would save her. Didn't she know that Mithradates and his kind were space-fairing people. How did they think Mithradates came to be? He flipped his wings and rose high above the moon. He thought it might be nice to visit his parents again and so he set off toward Betel Guese and home! Thanx for visitng this page, I hope you enjoyed your visit. Please wander the site and taste the sweet and sour. As always your thoughts or critiques are very welcome so please feel free to email me.